The Program for International Energy Technologies (PIET) developed D-lab and the Path to Zero Net Energy (ZNE) Initiative to engage students in finding solutions to energy issues in developed and developing countries. 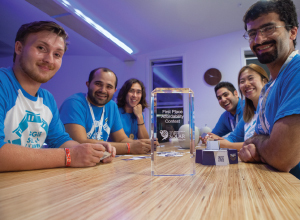 Founded in 2008, The UC Davis D-Lab works with international partners to find scalable, sustainable solutions for specific energy issues in their host communities. 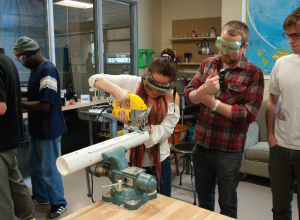 Faculty and graduate students from Engineering, International Agriculture Development, Community Development, Business, and Economics work together in teams in the lab and in the field. Using a bottom-up approach, D-Lab works with local communities to understand specific energy needs and assess the sustainability of proposed energy solutions through technical, social, environmental, and financial lenses. D-Lab focuses on innovative technologies and business models that can allow people at the “bottom of the pyramid” to save or earn more money. D-Lab is building expertise in water pumping and irrigation, post harvest drying and storage, off-grid lighting and micro power, and small-scale renewable energy such as solar and biogas. 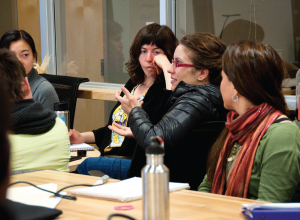 The PZNE Initiative, in partnership with the UC Davis Energy Conservation Office, is a multi-disciplinary course to educate and engage students in issues of energy use, demand, energy efficiency, renewable energy and climate neutrality as well as their associated technical, economic, social and political challenges. Through lectures, field trips, and a hands-on project, students will understand the concepts behind zero net energy buildings and communities, and the associated climate and economic issues. Every two years the U.S. Department of Energy hosts the Solar Decathlon, a competition that challenges collegiate teams to design and build full-size, solar-powered homes that push the limits of innovation in sustainability. Teams and their houses compete in a series of 10 contests to determine an overall winner. In 2017, UC Davis competed for a second time in the Solar Decathlon, designing and building Our H2Ouse—an original design that addresses the severe drought in California by cutting the water use in a typical residence in half, while maintaining the same level of comfort at an affordable price point. The team received second place in the Water and Communications contests, third place in the Health & Comfort contest, and fourth place in the Engineering & Home Life contests. 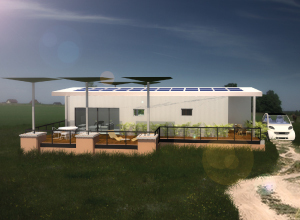 In 2015, UC Davis competed, for the first time in the Solar Decathlon, designing and building AggieSol, a zero net energy house for underserved farmworkers. The Team won first place for affordability and commuting.